Earlier this morning we wrote about a boy that was caught with a cutlass and beaten up by community security men. In a nutshell the boy was an evil boy sent to behead someone in oghara - efe it was reported that he can from Jesse town. 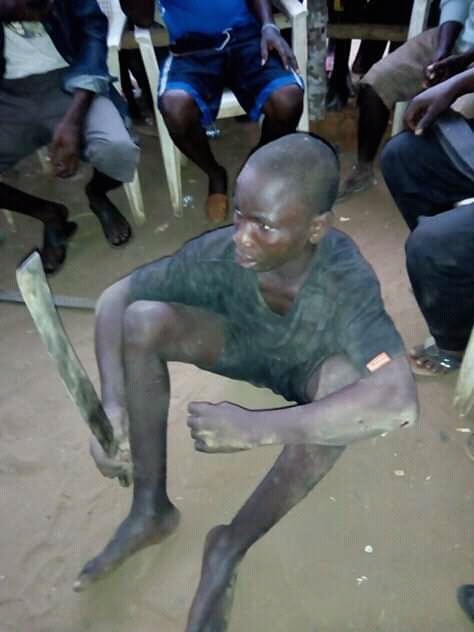 A little boy who is alleged to be a ritualist, was apprehended in Oghara town in Delta state this morning. Ossai Success Ovie who is an aide to the Delta state governor, shared the photos on his Facebook page this morning and said the boy was caught in the act. THE END OF RITUALISTS IN DELTA STATE. This small boy came all the way from Jesse to Oghara to behead someone for ritual purpose But unfortunately luck ran out of him .